I'd like to report here some toughts and quotes from people/friends interested in magic studies and practice. I mention only the points valid to me and my own experience/beliefs..
"In malis spiritibus praesunt ... Quatuor reges potentissimi iuxta quatuor partes mundi, quorum nomina appellantur Urieus, rex Orientis, Amaymon, rex Meridiei, Paymon, rex Occidentis, Egyn, rex Septentrionis; quos ebreorum doctores forte rectius vocant Samael, Azael, Mahazael; sub quibus plures alii dominantur principes legionum et presides". The Four Kings Zoroaster discovered… ‘those four spirits of great virtue who standin cruciatas locis, that is in east, west, south, and north,whose names are as follows: Oriens, Amaymon, Paymon and Egim, who are spirits of the major hierarchy and who have under them twenty-five legions of spirits each…’ (Cecco d’Ascoli 1257–1327 victim of the Inquisition). 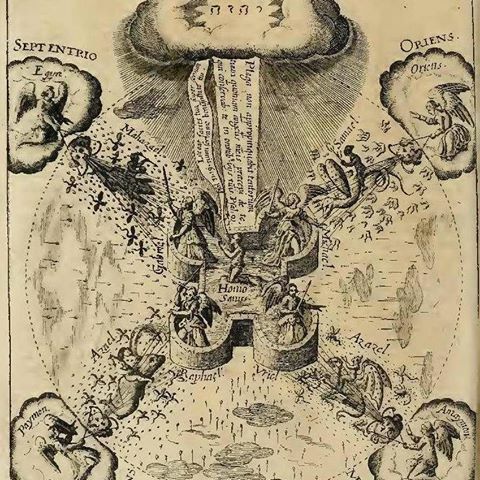 Agrippa's scale of the number four, book 2, chapter 7 demonstrates the four “princes of spirits upon the four angles of the world” (Oriens, Egyn, Paymon, and Ayomon) are separate entities differentiated from the four princes of devils, (Sammael, Azazel, Azael, and Mahazael). "O Oriens, splendor lucis aeternae, et sol justitiae:Veni, et illumina sedentis in tenebris, et umbra mortis". 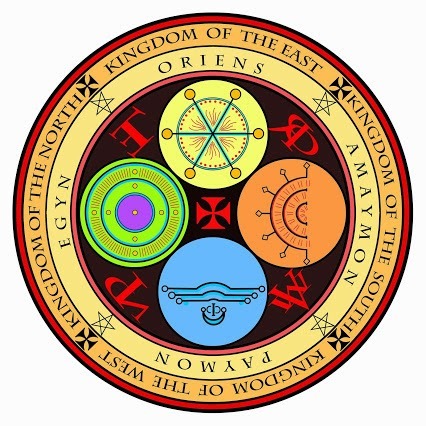 Oriens (Uriens), Amaymon (Maymon,Mimoun,Mammon), Paymon (Paimon) and Egyn (Egin)..
'The four kings are spiritual creatures (and therefore winged) but they are demon kings not angels. They are attacking the fortress guarded by 4 archangels who are thwarting their attacks. Each demon king is aided by a demon prince (Samael, Azael, Azazel and Mahahzael). The picture was originally conceived of as relating to health (homo sanus) but has a wider magical meaning'. The prayer going up from the central figure: psalm 30/31, verse 17, whose modern translation is: Make thy face to shine upon thy servant; save me in thy mercy.There is considerable variation in identification of the four kings of the cardinal directions. Here are a few: Agrippa, OP2.7 has (E, W, N, S): "Oriens.Paymon.Egyn.Amaymon", however in OP3.24 he says, "Urieus, King of the East; Amaymon, King of the South; Paymon, King of the West; Egin, King of the North, which the Hebrew Doctors perhaps call more rightly thus, Samuel, Azazel, Azael, Mahazuel," (See Cichus In Sphaeram Mundi, f. 21 apud quem: Zoroa. Fragm. O104; cf. Salom. ff. 28v-29r; sed addict. K: Reuchl. Arte 3, sig. O7r) MC has: "Bael, Moymon, Poymon, Egyn" or "Asmodel in the East, Amaymon in the South, Paymon in the West, and Aegym in the North"; "Oriens, Paymon, Egyn, and Amaymon"; or "Amodeo [sic] (king of the East), Paymon (king of the West), Egion (king of the North), and Maimon." The response from the יהוה cloud: an abbreviated version of Psalm 90/91, verses 10 and 11, whose modern translation is: There shall no evil come to thee: nor shall the scourge come near thy dwelling./For he has given his angels charge over thee; to keep thee in all thy ways. 'The Kings cannot be approached in the same way you might approach the Archangels. Start with the lesser demons. Threaten them with the name of their King if necessary. Only after you have bound a few of the hierarchy, then think about the Kings. You can use the Kings name without having previously called him' (that is just the way it works). ...'The Kings open the Gates, not something anyone should do unless they really know what they are doing. Their names are useful to enforce discipline on the spirits belonging to their legions. But, as Frater AC mentioned, they are not the ones you would choose to personally grant the usual run of wishes'. Oriens is associated with the East - and starting from that point, all the Kings are shown correctly in the diagram. The TOP of the diagram appears to be NE, not East. In demonology there are traditionally four principal kings, one for each of the four cardinal points; however, sources vary as to who exactly those king are. Three lists are commonly cited. The first names the four kings as AMAYMON, King of the East, CORSON, King of the South; GAAP, King of the West; and ZIMINIAR, King of the North. The second list of commonly cited kings is made up of ASMODAI, BELLETH, BELIAL, and GAAP. The third and final list names AMAYMON, King of the South; EGYN, King of the North; PAYMON, King of the West; and URICUS, King of the East. The direction of the demon kings is very confused - depends upon what text you read. My Complete Magicians tables gives all the variant in Tables M62 and M63. The bottom line is there are 2 basic traditions: Agrippa+KoS+Honorius+Abramelin+Clavis vs. Weirus+Scot+Goetia. #1 There are at least two *lists* of four 'kings' in the Goetia. One tells us which are the most powerful in Solomon's vessel. None of the Four GREAT Kings are included, and it is only three in the Weyer/Scot text, and also in a completely different part of the text (in W/S the passage is mentioned under Belial, not at the end of the catalog as in the GoS): 'Salomon gathered them togither with their legions in a brasen vessell, where were inclosed among all the legions seventie two KINGs, of whome the cheefe was Bileth, the second was Beliall, the third Asmoday... for this Beliall, with three KINGs were in the lake'. As well as omitting Gaap (added in the GoS version) there is the problem that Bileth is listed in the same column as Asmoday in BoO, so they apparently answer to the same superior (Amaymon). #2 The second list is that in the OP, but it is deeply problematic. We can tell from comparison of Weyer/GoS with BoO that Paimon is definitely one of the Four Kings in this system, served by two sub kings. (S)he is on the same level as Amaimon, plus of course Oriens and Egin. Yet of the four only Amaymon is listed in this entry. Corson - same as Pursan - is actually a sub king, likely under Oriens, and thus outranked by Bael. So this passage already looks suspect before we start wondering who the heck Ziminiar is (he might be another sub-king, Zagan, but there is no telling for sure). Goap is never called a King in the catalogs, and is hard to identify anywhere but in Weyer/Scot/GoS. He's undoubtedly important, but some of Weyer's tampering may have wrecked things intentionally. I really don't rate this passage at all, Amaymon plainly massively outranks two out of the three mentioned alongside. It only makes sense if we 1) read it as a list of Gt Kings Oriens, Amaymon, Paymon and Egin, OR 2) reckon Amaymon is a slip, perhaps Asmoday or even Bileth was intended and it is a list of lesser kings. The Gaap text in Weyer/Scot is very interesting, but may not tell us too much about Gaap. Most of it appears tangential, and it's relation to this question is mainly thru the following: 'Gaap, alias Tap, a great president and a prince. . .is the *guide* of the foure principall KINGs, as mightie as Bileth'. This appears to put him on a par with Bileth, who as mentioned is a secondary King (outranked by Asmoday). To sum up for now, there are several kings in the GoS, and they appear to be meant to divide into at least two groups. A 'First and Principal' king under each great King, and at least one lesser one. This is much plainer in BoO, but the Paymon entry agrees (Belial and Balam are the 1st and 2nd king beneath Paymon - a pattern we can probably anticipate for the other three great Kings too). PS, in Weyer/Scot five spirits have *much* longer entries than the others, these are Paymon plus: Belial, Bileth, Asmoday and Gaap, the same 'kings' listed in #1. Longer because they are more important and probably featured in a separate part of the original catalog which didn't jumble them all together and deliberately alter things, That is something which Weyer admits to doing, quite deliberately, and everything since that date has been damage control and reconstruction. There is considerable variation in identification of the four kings of the cardinal directions. Here are a few: Agrippa, OP2.7 has (E, W, N, S): "Oriens.Paymon.Egyn.Amaymon", however in OP3.24 he says, "Urieus, King of the East; Amaymon, King of the South; Paymon, King of the West; Egin, King of the North, which the Hebrew Doctors perhaps call more rightly thus, Samuel, Azazel, Azael, Mahazuel," (See Cichus In Sphaeram Mundi, f. 21 apud quem: Zoroa. Fragm. O104; cf. Salom. ff. 28v-29r; sed addict. K: Reuchl. Arte 3, sig. O7r) MC has: "Bael, Moymon, Poymon, Egyn" or "Asmodel in the East, Amaymon in the South, Paymon in the West, and Aegym in the North"; "Oriens, Paymon, Egyn, and Amaymon"; or "Amodeo [sic] (king of the East), Paymon (king of the West), Egion (king of the North), and Maimon." The holy table is positioned according to the directions and has the primarily 'king' pointing in its proper direction during evocation. These "horizontal" gatekeepers direct the level of interaction and excange between both infernal and celestial spirits of all ranks. They are considered "morally neutral" for this task (according to Archangel Metetron) and are designed specifically to fill the complexity of this task in unison. From what Ive been told about them and from them individually, conjurations-evocation would not be possible in many instances without their -Direct- assistance. Each of the 4 fuffil a very specific function which completes the proper level of exchange between the various spiritual/astral/celestial realms and the physical plane on earth. The first description I got of them was, “As we (the archangels and angels) are the vertical, they are the horizontal. They are the morally neutral yet powerful governors between the planes of existence.” I hope this helps some who wanted further clarification on what I was getting at. 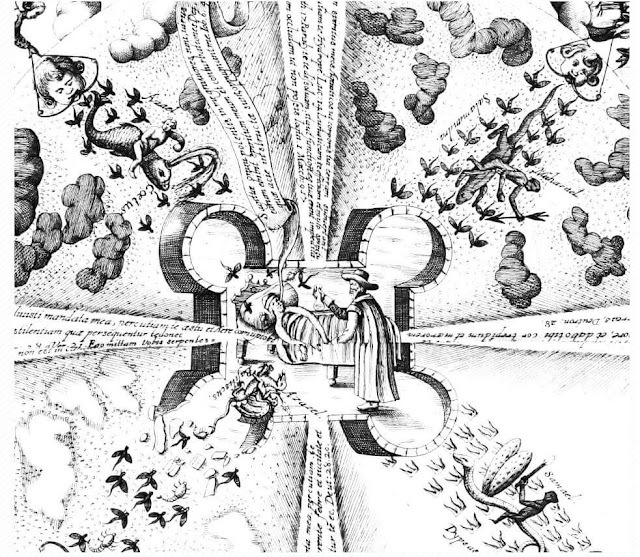 The writings are in the "Transtus Fluvii" magical alphabet (see Agrippa). The words form the names of the 4 archangels (Auriel is written without the Aleph) and names of God : YHWH, HYNW, ShDY, AChTh. According to Stephen Skinner: Maymon has GBRIAL HINV which was encoded by moving two letters to the right and amalgamating two letters, with the last NV read as M. GBRIAL HINV = GBRI ALHINV = ALHIM. Crazy, I know, but that is how it was encoded. I confess I can't work out AChTh.. This grimoire is deliberately difficult, with reversed Latin passages, coded symbols and language changes. The clue was that the invocations were familiar from the Heptameron. BELOW- Figure is the Demon King Maymon, with angel name GBRIAL (Gabriel) and godname HINV (Alhim). 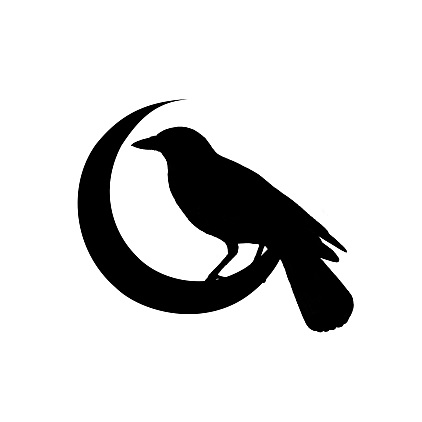 Maymon (Amaymon) - a black bird - as King of the South." Cyprianus, Clavis Inferni, late 18th century. Clavis Inferni by Stephen Skinner, Golden Hoard, 2009. BELOW- "Uricus (Urieus,Oriens) King of the East, with MIKAL (Michael) and IHVH - a red-crowned and winged serpent." Cyprianus, Clavis Inferni, late 18th century. Clavis Inferni by Stephen Skinner, Golden Hoard, 2009. 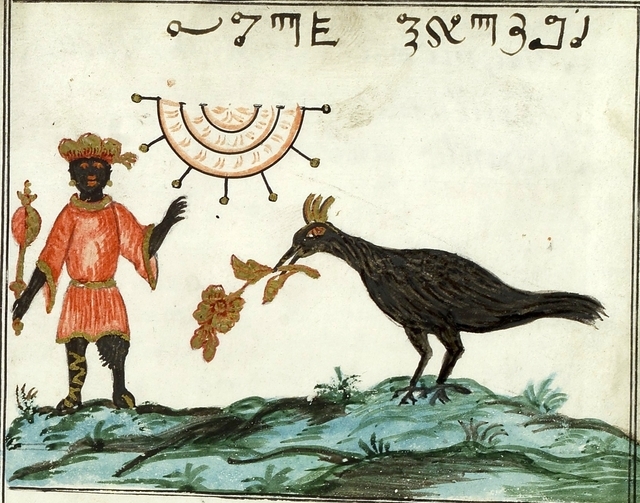 BELOW- Figure is the Demon King of the North Egyn, with angel URIAL (Uriel) and godname AChTh - a black bear-like animal with a short tail. Cyprianus, Clavis Inferni, late 18th century. Clavis Inferni by Stephen Skinner, Golden Hoard, 2009. BELOW- "Paymon,Demon King of the West, with RPAL (Raphael) and ShDI (Shaddai). - a black cat-like animal with horns, long whiskers and tail. Cyprianus, Clavis Inferni, late 18th century. Clavis Inferni by Stephen Skinner, Golden Hoard, 2009. Grimoire Tradition sometimes shows the Demons (Elemental) Kings, Here is MAMMON. 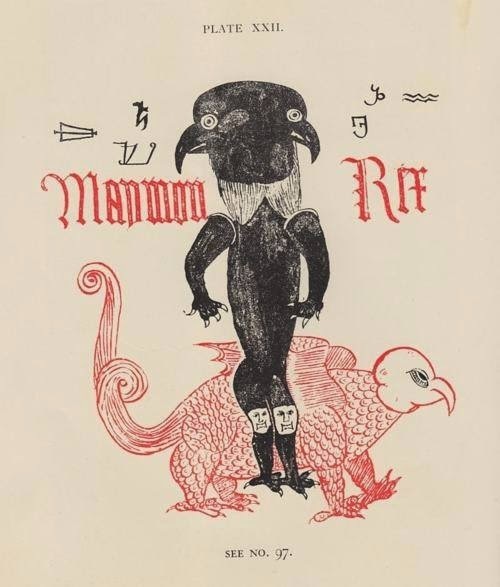 Mammon sometimes mingled/confused with the Demon King MAYMON..
From Mr Skinner: This comes from a Latin grimoire sold in London by Maggs Brothers in 1932 to a private buyer. Whereabouts currently unknown... The same MS also had an interesting picture of Vercan being attacked by many archers and serpents. In the notes to the True Grimoire, various questions surrounding the Four Kings who appear in various grimoires were addressed. These four are undoubtedly among the most important figures of the old demonology, yet until recently they scarcely featured inmodern practice. They are beginning to emerge from this obscurityto take their proper place, along with the three chiefs, as rulers of the majority of better known spirits. Nevertheless, the full extent of their role is as yet unsuspected by many. Even some dedicated grimoire purists exclude them from their prior roles throughmis identification. For such reasons, before embarking on a profileof the individual Kings, the contexts in which they appear in theliterature require close examination. Some Solomonic magicians interpret this reference to the Four Kings as meaning the same angels as on the crystal mounting. However, while the term 'angels' is used liberally in the text, it does not appear in relation to the four kings. A far more straight forward identification is not out of reach. Consider first Trithemius’ pupil, Agrippa, in particular his Scale ofthe Number Four, which table is also included in Barrett. Among three pages of columnar correspondences, we find in thefirst part: Four angels ruling over the corners of the world: Michael, Raphael, Gabriel & Uriel. As can be seen, this title does not mention kings. Directly following is another group of four entities. Four rulers of the elements: Seraph, Cherub, Tharsi and Ariel. The four kings mentioned by Trithemius share no resemblance oftitle with these ‘four rulers of the elements’. Both they and the four kings are also named in the 6th & 7th Books of Moses; since this mentions Agrippa by name it is obviously secondary and we need not consider it separately. It will be necessary later to discuss another group of elemental rulers who are more similar to our kings. As regards the Solomonic textual tradition their names are of too late a vintage for the present discussion. On the other hand their names are – so to speak – structurally similar to the ‘four rulers’ just considered. Four Princes of Devils, offensive in the elements, Samael,Azazel, Azael, Mahazael. Four princes of spirits, upon the four angles of the world, Oriens, Paymon, Egyn, Amaymon. As can be seen, of all these sets of four the only one with a clear resemblance to the kings is the last. The first set of angels and thethird set in this group both mention four corners or angles; the third set alone are described as princes rather than angels. To make the identity crystal clear, the use of the term prince rather than king in this table involves no distinction whatever; the original Latin text gives ‘rex’ for Oriens and his companions. This is simply a subtlety of translation; in English the two words are often interchangeable. Agrippa’s text also constitutes the classic andmost reliable attribution of our Kings. The ‘alternative’ elemental rulers: Ariel/Aral, Seraph, Tharsis and Kerub appear to be littlemore than angelic shadows of our chthonian kings. This is unsurprising as the more material spirits are treated so variously indifferent sources. So far as regards Djin, Ghob, Paralda and Nicksa, they are much later and in any case there is no indication that they are distinct from the four kings. Having argued the case at length, the four kings are ‘on the table’;if you will pardon the expression. Clearly they are not angels in the usual sense of the word; the various sources discussed in the True Grimoire identify them either as demon kings or chiefs of the elementals, if indeed we need to distinguish the two. Also, unlike the four angels, whose planetary role is emphasised, they are clearly associated with the four corners/angles of the world/earth. To use the relevant terminology from Agrippa &c, the planetary angels are celestial, the Kings or princes are Sub-Lunar orTerrestrial. Other terms for the latter would be Infernal or Chthonic.To sum up as regards the ritual table, as the matter is an importantone. The circle is a double one. The likelihood is that the sevenplanetary angels would be in the outer circle, the four kings within. They are thus not ‘mixed’, and in any case there are many precedents for ‘demons’ names being written in circles, the best examples being in Clm 849 (Forbidden Rites. A necromancer’smanual of the C15th. Richard Kieckhefer). The triangle inside this circle gives it a resemblance to the floor circle employed in The Grand Grimoire, Black Pullet, &c. In any goetic rite the employment of the four kings would be wholly understandable. It is a fact that Trithemius nowadays interests magicians working with angels. Nevertheless we can infer that originally the operator could and would work with both the planetary angels and with elementals. Also, so far as material results are concerned, the presence of the Four Kings in the altar design makes perfect sense. Turning now to the Grimoire of Honorius, the ritual process of this text includes invocations of the Four Kings. The text may be seen below, and while the names and directions are muddled the form is deserving of examination. Before proceeding, take note thatHonorius is known to utilise material from True Black Magic, wherean even more illuminating mention of the Four Kings occurs. CONJURATION OF THE KING OF THE EAST. I conjure and invoke thee, O powerful King of the East Magoa, by my holy labour, by all the names of Divinity, by the name of the All-Powerful: I command thee to obey, and to come to me, or thatfailing, forth with and immediately to send unto me Massayel, Ariel,Satiel, Arduel, Acorib, to respond concerning all that I would know and to fulfil all that I shall command. Else thou shalt come verily inthine own person to satisfy my will; which refusing, I shall compel thee by all the virtue and power of God. [NOTE] The Grand Pentacle or Circle of Solomon will answer for the above and following Conjurations, which can be said on all days and at all hours. If it be desired to speak only with one spirit, one only need be named, at the choice of the reader. CONJURATION OF THE KING OF THE SOUTH. O Egym, great King of the South, I conjure and invoke thee by the most high and holy Names of God, do thou here manifest, clothed with all thy power; come before this circle, or at least send me forth with Fadal, Nastrache, to make answer unto me, and to execute all my wishes. If thou failest, I shall force thee by God Himself. CONJURATION OF THE KING OF THE WEST. O Baymon, most potent King, who reignest in the Western quarter, Icall and I invoke thee in the name of the Deity! I command thee by virtue of the Most High, to send me immediately before this circle the Spirit Passiel Rosus, with all other Spirits who are subject unto thee, that the same may answer in everything, even as I shall require them. If thou failest, I will torment thee with the sword of fire divine; I will multiply thy sufferings, and will burn thee. CONJURATION OF THE KING OF THE NORTH. O thou, Amaymon, King and Emperor of the Northern parts, I call,invoke, exorcise, and conjure thee, by the virtue and power of the Creator, and by the virtue of virtues, to send me presently, and without delay, Madael, Laaval, Bamlahe, Belem, and Ramath, withall other Spirits of thine obedience, in comely and human form! In whatsoever place thou now art, come hither and render that honourwhich thou owest to the true living God, who is thy Creator. In thename of the Father, of the Son, and of the Holy Ghost, come therefore, and be obedient, in front of this circle, without peril to my body or soul. Appear in comely human form, with no terror encompassing thee. I conjure thee, make haste, come straightway,and at once. The following forms a part of a ritual from True Black Magic; it may be the inspiration for the invocations considered above, or reflect aparallel tradition. It requires saying in advance that the context inwhich it is embedded may have obscured its importance, certainly it is dismissed by Waite. Although omitted by Mathers from his Key the following ritual derives from the highly regarded Colorno manuscripts of the Key of Solomon (Kings MS 288. See VeritableKey. Skinner & Rankine). While the ritual of which it is part is anamatory working, the script appears to be highly adaptable, withthe appearance of what modern magicians term ‘a frame ritual’.One might be forgiven for imagining the table of Trithemius forming a part of such a modus operandi. "O Eastern Asmodee, most shining, most excellent King, who reignsand hath command in Eastern Regions, whose Kingdom hath had commencement at the beginning of the World and which will endure until the end of the Ages". "O Thou Paymon, King most glorious, who holds powerful dominion inthe Western Regions of the Heavens". "O Thou Egyn, King most strong, whose Kingdom and Empire reachesinto the cold regions of the North". "O Thou Amaymon, King most noble, who holds sway over theregions of the South". "I invoke you all with power and I pray to you with the authority ofthe One who spoke and who hath made all, and who, with one soleword gave birth to the world and whom all Creatures obey. By the Seat of his Majesty, by which he hath created the Ages before thepermanent Ages, who is described with four letters, Jod, He, Vau,He, and by all the talismans and their virtues, and by the great and august names of the Creator, that you may consecrate the image here present as it is fit and meet to do so and may you create it so that it may obtain and impel N.N. whom we also desire by the most holy name of Adonay, whose virtue hath no beginning and will have no end". The Kings are treated with honour in this, the more dependable ofthe invocations we have of them. The conception resembles theAbognazar text of the Key (1203 Lansdowne MSS); where thekings rule undemonised elemental spirits. (See ‘Who are theSpirits?’; True Grimoire, pp 139, 140, and passim). There can be little doubt that the earliest grimoires feature spirits ofthe four directions and their chiefs (kings or princes indifferently).They are found in both the Hygromanteia and Liber Juratus. In thecase of the former the names are instantly recognisable. Joseph H. Peterson observes that the three chiefs in the True Grimoire are probably derived from this group, with the omission of Asmodai. This is certainly one of the many ways in which the True Grimoire reflects very early traditions of the Solomonic cycle. At the same time we must be aware of similar absences and failures of correlation in other grimoires. There is certainly no reason to dismiss the True Grimoire as inferior in any respect, as has been done in the past. One of the most significant examples of a four fold division of spirits and chiefs is in another highly regarded work, the Sacred Magic of Abramelin the Mage. This is most interesting, asthe chiefs of several different texts are here grouped together inone. Among other notable features of this source is that the second line follows the chiefs in the Hygromanteia except that Lucifer has been replaced by Magot. The third line is the same group as given in Agrippa, which has wider currency in a variety of grimoires, give or take some variants of name and attribution. There is no doubt in either source that Astaroth is counted among the most prominent spirits. This is also the case with the True Grimoire and elsewhere.The use of the title Duke in Abramelin is also helpful. It is hard to avoid the conclusion that the spirits the Goetia of Solomon takes from Weyer are a random selection where chiefs and kings are lumped in with subordinates without differentiation.In other words despite its modern status and many interesting features, when it comes to understanding the spirit hierarchy specifically it is a most unhelpful resource. The work of Skinner & Rankine presents us with a dichotomy. Much is made of the manuscripts of Doctor Rudd, where a group of three possesses great status, namely Lucifer, Belzebuth and Satan. It should be noted that the four kings are specifically mentioned alongside the directions in the MS; this agrees with Agrippa and other sources. Inferring that the four greater chiefs are reliably attributed in the same order may not necessarily follow. Indeed Lucifer’s association with the East in earlier sources has more authority. Judging from other works made available by this industrious duo, the possibility that Dansiation is a variant of Dantalion seems reasonably high. Dantalion however is not part ofthe Weyer & Scot list; he appears to have been inserted into the Goetia separately at a later date, so this attribution cannot be deemed authoritative. In Demonology, Amaymon (also Amaimon, or Amoymon) is a Prince of Hell, and, according to some Grimoires, the only one who has power over Asmodai. 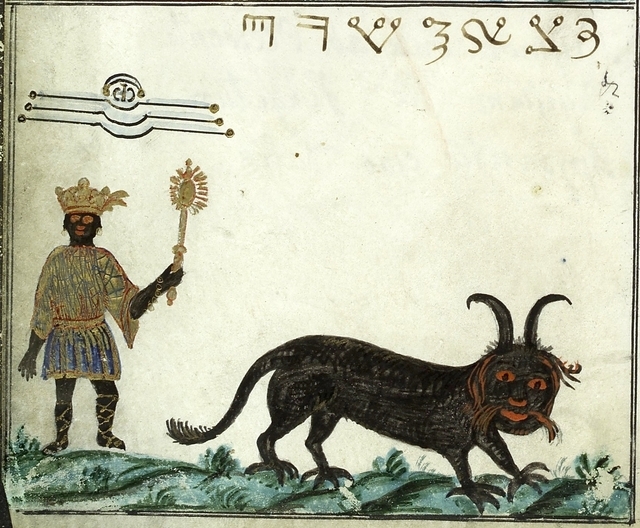 A curious characteristic of this Spirit is shown during the Evocation of Asmodai to visible appearance, when the Exorcist must stand upright with his Cap or Headdress removed in a show of respect; for if he does not it is Amaymon who will deceive him and doom all his work.Amaymon is said to have a deadly poisonous breath.The Lesser Key of Solomon states the Exorcist or conjurer must be in possession of a Silver Ring, duly consecrated and worn on the middle finger as a form of protection against this poisonous astral breath.According to Pseudomonarchia Daemonum he is the King of the West, although for some translations of The Lesser Key of Solomon he is King of the East (Although some translations of The Lesser Key of Solomon consider Belial, Beleth, Asmodai and Gaap kings of the four cardinal directions, though not giving detail on the cardinal point each rule). 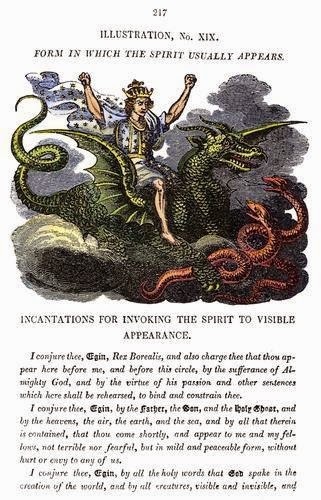 According to The Goetia, Paimon is one of the Kings of Hell, more obedient to Lucifer than other kings are, and has two hundred (one hundred to other authors) legions of demons under his rule. He has a great voice and roars as soon as he comes, speaking in this manner for a while, until the conjurer compels him and then he answers clearly the questions he is asked. When the conjurer invokes this demon he must look towards the northwest (the west to other authors), for there is where he has his house, and when Paimon appears he must be allowed to ask what he wishes and be answered, in order to obtain the same from him.Paimon teaches all arts, philosophy and sciences, and secret things; he can reveal all mysteries of the Earth, wind and water, what the mind is, and everything the conjurer wants to know, gives good familiars, dignities and confirms them, binds men to the conjurer's will.If Paimon is cited alone, some offering or sacrifice must be done, and he will accept it; then two kings called Beball (Bebal or Labal) and Abalam (Abalim) will go to him together with other spirits, often twenty-five legions; but these other spirits do not always come unless the conjurer call upon them.Paimon is depicted as a man with an effeminate face (a strong man with a woman's face according to other authors), wearing a precious crown, and riding a dromedary. Before him often goes a host demons with the shape of men, playing trumpets, cymbals, and any other sort of musical instruments. 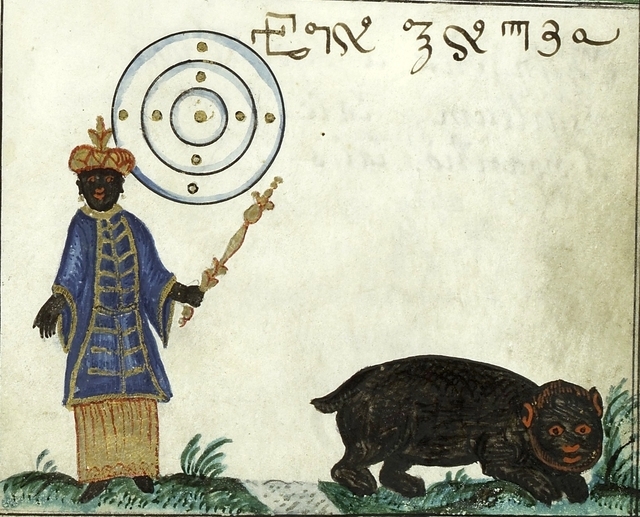 Oriens, is a demon in Mathers' translation of the Sacred Magic of Abramelin the Mage. Oriens is one of the four demons overseeing the cardinal directions. The Latin root of his name suggests that Oriens is the infernal King of the East. Furthermore Mathers equates him to the fallen angel Samael (see Book of Enoch), which further suggests a variation of the name is responsible for "Sir Uriens," a title popular in medieval times. Oriens is one of eight demonic sub-princes whose names are scribe on paper on the second day of the Holy Guardian Angel working. Supposedly on the third day the manifest themselves to the magickan at which time he must make them swear their loyalty to him - first on his wand and then on his book. The purpose of acquiring the loyalty of these demons is to have them lend their power in performing magickal tasks.Many abilities are attributed to Oriens such as giving vast amounts of wealth to the magickan in the forms of silver and gold, answering questions of the past, present, and future, giving visions, giving power to fly, excellent in providing familiar spirits, conjuring men to assist the magickan, and reviving the dead.Oriens controls a vast number of other demons who share his powers which can be loaned upon command. His name is known in grimoiric tradition as Oriens appears in numerous works including the Sixth and Seventh Books of Moses, and in Agrippa's Three Books of Occult Philosophy, where his names is spelled Uriens. 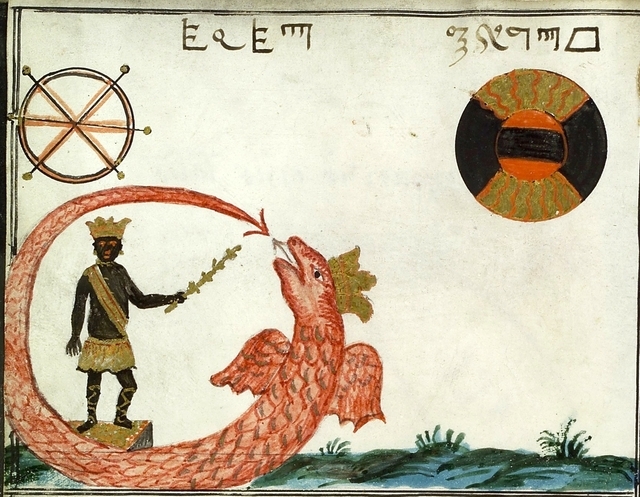 Ariton sometimes also known as Egin or Egyn, is a demonic subprince with dominion over water. He commands twenty-two servitors. His name is possibly taken from Hebrew and if so would translate to mean "to delay," or "to hinder." Ariton is listed as one of eight sub-princes in an extended demonic hierarchy that includes such familiar faces as Beelzebub, Asmodeus, and Astaroth. He is also named as one of the four demons who presides over the cardinal directions. Under his alternate names of Egyn, he oversees the north. This demon is attributed with the power to discover hidden treasure. He knows the past, present, and future, and can cause people to have visions. He can make spirits appear and take any form, and he can also give familiars. In addition, Ariton is reputed to have the power to revive the dead. He reveals the identities of thieves, gifts people with the power of flight, and can make warriors manifest to protect his charges. Une autre Invocation: cette dernière s'adresse à un seul Roi en particulier au cours du rituel selon l'orientation choisie..
(Below) Officium de spirittibus (The offices of spirits) from the 'Book of Oberon'. Amaymon king of the south, and Egine king of the north'. Orience the king appeareth with 100 or 200 legions, and that fair with a feminine countenance, and a goodly crown upon his head. He rideth upon an elephant, having before him trumpets, shawms, and much minstrelsy, of diverse instruments, and when he is called, he cometh with other great kings, but Note and if he be called alone, he then appeareth in the likeness of an horse, that is of the Throne, having of an horse the very shape, and when that he is sacrificed unto or offered unto, then he taketh such a shape as the master will, and he doth willingly receive the sacrifice or offering. He giveth well nigh an answer to all demands and questions, and telleth the truth of things past, present, and to come, and if that he be angry, he will vex all them that do not sacrifice unto him, except that he do give money or teach sciences, and then he is compelled, and that by divine power to the contrary. He hath power to consecrate books, and he knoweth all experiments, and hath power to teach them, and there is a king under him whose name is Baall, and his office is to teach a man all manner of sciences, and maketh a man to go invisible, and hath under him 250 legions, yet at the first you must constrain a spirit called Pernell, who is the messenger of the east. Note, let the master say: 0 thou Bellfarto or Bellferit, the which is the messenger of the king of the east, I conjure thee, and that by the living God, and by the blessed Virgin Mary Mother of our Lord Jesus Christ, and by the thrones of angels, and by the blessed Apostles, and by the saints of God, that now presently and without any delay or tarrying, the same spirit which is called Pernell that thou make or cause to appear, and obey my will, and do my commandment, and that with all speed, so be it..
Paymon the king; he appeareth and speaketh with a hoarse voice, and he being called is more obedient to the will of Lucifer than of any of the other kings be, and thou compel him by divine power, then he appeareth in the likeness of a soldier, yet when that he cometh to the presence of the m [aste] r, he maketh variance still. He rideth upon a dromedary or a camel, and is crowned with a bright crown, and hath the countenance of a woman, and before him goeth a band of men, and that with trumpets and all kind of instruments, and Paymon himself speaketh with his tongue, yet the master shall cast to him a paper wherein it is written, that he shall speak plainly and distinctly, that the master may understand what he sayeth, and so then he will, and there is Belferth, the messenger of the king of the west, and there is Belial, a king, and Baasan, a king, and they do make a man to go invisible, and Rombalence or Ramblane. These may appear from the third hour to the twelfth hour following. Then say, "And thou Alphasis, I conjure thee, and that by the most meek Lord our Saviour Jesus Christ, and by the sphere that clave his heart asunder, and that to the redemption of all mankind, and by the nails that pierced his blessed hands and feet, and by all the virtues of God, and by all the holy names of God, Agios + Yskiros + Athanatos + Otheos + Alpha + and Omega + Agla + El + Tetragramaton + that now shortly and that, without any tarrying, this same spirit Alphassis to be here ready, and to do all that I here shall command him to do, for me N. and that you now here do yield him unto me, and that without delay or long tarrying, and here to fulfil my petition and desire. So be it." Amaymon the king is of the south, and is great and mighty, and he appeareth in the likeness of an old man with a great beard, his hairs like to a horse's hairs. He hath a bright crown on his head and rideth upon a fierce lion roaring, and he shaketh a rod in his hand and his ministers go before him with all manner of instruments and music, and he cometh with other three kings, and he gladly doth receive sacrifice and burnt offerings and gifts. He maketh answer to all things, and maketh a man wonderful cunning and expert in philosophy, and in the art notaria, and he giveth the best acquaintance with nobility, and confirmeth the doings thereof, as dignity and promotion. He may well be kept in obedience one hour, during which time he may be used, but let the master turn into the south to receive him, and that gently and eke with pleasantness, and declare unto him the thing thou wouldst have taken in hand, and hold thou thy ring upon thy face, and he will do thy will, and call thou him in a fair air, or day, and look that thou have the ring of Solomon, and the stole and the ausipites or coronepes. He cometh with all manner of invisibility, and a great company with him, and therein be kings, i.e., Emlon, Ocarbydatonn, and Madyconn. These kings be messengers of the king ofthe south, to whom shall be said: "I conjure you now by God, and by St. Mary, his son Christus' mother, and by the thrones and choirs of angels , and by the death and passion of our Saviour Jesus Christ, and by Abraham, Isaac, and Jacob, and by Moses, Ely, Enoch, and David, and by holy Shem, Noah, and Lot, and by Elizabeth, Katherine, and Margaret, and by all the prophets, Isaiah, Jeremiah, Ezekiel, Daniel, Habakkuk, Zachariah, Malachi, Zephaniah, Joel, and Abdy [Obadiah?] , that now shortly, without any tarrying, you cause the same spirit Emlon, that he shortly and speedily come to me, obey me, and fulfill my will and desire. I charge and command you by our Lord Jesus Christ that you yield him to me and that without any delay or tarrying." This, when he cometh, may tarry from twelve at noon till midnight. Egyn the king, is of the north, and appeareth in the likeness of a man, and his face is very clear. His nostrils are very sharp like a sword, and out of his mouth cometh flames of fire, and he rideth upon a dragon, and he is crowned with a crown of precious stones, and in his cheeks he beareth two tusks, and he beareth on his right side two hissing serpents shining, and he cometh with a great noise and clamour before him go sundry kinds of musical instruments and sweet organs, and he teacheth perfectly all physic, and singing, and the art Notaria, and the art of Nigromancy, and the art memorativia, and he speaketh of and in diverse parts of the world, and of things to come, past, and present, and of certain secrets, and hid things, and of the being and compacting of this world, and what the earth is, and whether the water may sustain the earth or the earth the water, and he telleth what a bottomless pit is called, commonly the Abyss, and where it is, and what the wind is, and from whence it cometh, and he giveth very good acquaintance and dignities, prelateships and confirmeth the same, and maketh consecration of books and other things, and giveth true answers of all questions and demands, and thou must look to the north when thou callest him, and so soon as he appeareth, show him the Seal of Solomon, and his ring, and forthwith he will fall down to the earth and will worship the master, and the master shall take and thank him therefore, and he hath 1 2,000 legions, and causeth a man to win at all manner of games, and Rodabell, or Radabelbes, be the messengers of the king of the North. "0 thou Lambricon, vel Lambracaron, kings of the north etc., they may come from midnight to the morning, I conjure thee, and that by the meek Lord Jesus Christ, and by him which hath made of naught all the world and all and every thing therein, and by Mary Magdalene, and by the Virgin Saint Katherine who slew Kwphin233 your brother, and by the crown of thorn that our saviour Jesus Christ had on his blessed head, and by the spear that he was pierced with to the heart, and by the nails wherewith his blessed hands and feet were fastened to the + of tree, and by these precious names La + Ya + Gala + Layagom + Vlba + Garanitom + Lasam + Sarym + Lassa + Ioratom + La + Ya + Lasary + that you now shortly, and that without any delay or tarrying, that this spirit by name Rodabell vel Radebelbes now to be here, ready and obedient to all my will, and that now herein you obey to me and that without any tarrying." Then say the conjuration that to the four kings doth appertain begin, then conjure those four messengers without fear, saying thus: "0 Pernell, Alphassis, Emlon Rodabell, I conjure you, etc.," as is aforesaid. 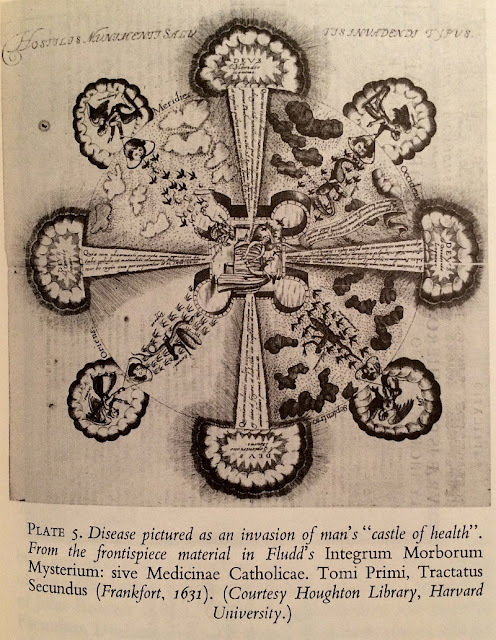 The Sacred Magic of Abramelin the Mage details an extensive hierarchy of demons in hell. Below are the joint servants of the Evil Kings of the four quarters of the World, Oriens, Paimon, Ariton and Amaymon, who are also four of the eight sub-princes in the demonic hierarchy. Seal / Pic © Copyright by Asterion. - 'Book of Oberon' Copyright 2015 by Daniel Harms (Author), James R. Clark (Author), Joseph H. Peterson (Author). - Stephen Skinner & David Rankine / Clavis Inferni (Golden Hoard, 2009).